Karen Carroll, singer, songwriter, musician, Chicago native, started singing in church at age 6. She was taught singing theory by master Robert Allen and Nate Griffin was her vocal coach. Karen worked with Lonnie Brooks, Albert King and The Freeman Bros very early in her career. It goes without saying that all along her career, she was supported by her mother Jeanne Carroll (respected, world wide Jazz artist) with whom she had her first professional gig. Since the early 80's she has appeared with Katie Webster, Albert King, Carey and Lurrie Bell, Rudy Rotta, Otis Grand, Willie Kent, Steve "Big Man" Clayton, Alvin Lee, Mongo Jerry, Mississippi Heat, Buddy Guy, Deitra Farr, Bonnie Lee, Eddie Clearwater, Sammie Fender, Eddie Shaw, Angela Brown, Billy Branch, Melvin Taylor, Lonnie Brooks, Byther Smith, Johnny B. Moore, Sugar Blue, Buddy Miles, Zora Young and many more musical wonders. 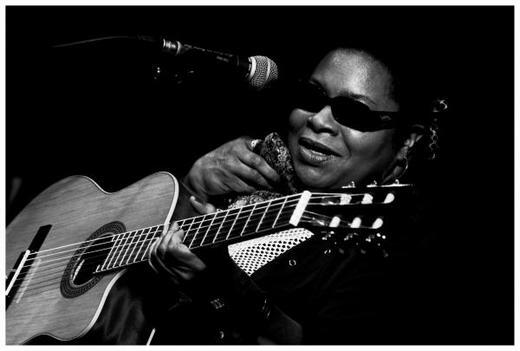 Singing gospel since her childhood she is an authentic performer of The Great American Deep Blues. Appearing twice at The Chicago Blues Festival; in 1996 and 2008 at the request of blues master B.B. King. Karen turned to Europe in 1998, touring with many different bands, creating and leading some. Today she works solo or with different bands, always provokeing a stormy applause from the audience. Works include “Had My Fun”, “Talk To The Hand" "Professors Blues Review”, “Women of Blue Chicago”, “Chicago’s Finest Blues Women” "Red Hot Mama's" and “Stock Yard Strutt”. In Europe Karen created "Be My Guest", "Live in Olesnica", "Ghetto Love", " Evolution Revolution", "Live in Coburg" and "Karen Carroll's Blues Mix". She also appears on many compilation Cd’s of Blues, Jazz and Gospel. She lives in Atlanta, Georgia after many years living and touring in Europe. Karen loves Koolaid, old fashion candy, reading, collecting books, computer games. Carroll makes time to spend with her family, cooking and schooling her grandchildren in her down time. She is a grandmother of 5 who keep her funk and spirit, fresh and hip. Putting God first, serving family, friends and fans leave her soul pumping out that unique groove and soulful flavor. There is only one Karen Carroll, a true, free loving spirit that will forever be a musical legand. Carroll just got done touring with The Mississippi Grave Diggers in Hungary working the Godor Club in Budapest. She also had a very special evening playing and singing (some in Hungarian) with Presser Gabor. Karen also was just the headliner at the Poland Jazz Festival in Olenscia. She's one busy OG who will always have and be the blues. She is thrilled to be back in the U.S. and ready to get her groove on.